My name is Ashley Bayles and after living in Colombia for four years, people started to tell me that I am practically Colombian (my Colombian name is Astrid Bailes). 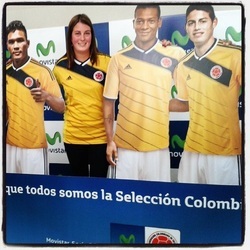 As Canadian as I may be, I will always carry Colombia with me in my heart. I titled this page ¨La Canadiense¨ which means the Canadian woman. I am often described by my Colombian friends as a Canadian with a Colombian heart, so I think that is quite the compliment. I feel that the culture shock I felt when I first arrived in a new country and all the learning about a new culture and myself that took place while living in Bogotá, Colombia is very similar to the process that has taken place during my studies in the Master of Educational Technology (MET) program. While it was a huge adjustment at first, eventually I learned how to adapt. I have taken parts of my new culture´s language and customs to create a mixture of experiences that makes me truly happy. I can never fully separate my MET learning from my time in Colombia since I was also completing my MET while living in Colombia, so this made me see things from a different perspective as well. My life in South America and my MET learning experience have both had a profound impact on my understanding of myself, my beliefs around what is important in education, and both will greatly influence the rest of my life. Without having experienced culture shock, I would not be the person I am today and I would not be able to relate as well with people who come from different backgrounds, and who speak different languages. The MET program has also allowed me to discuss educational technology and the different beliefs around that with people from all over the world. Please explore the different elements of culture and culture shock to understand how they relate to my MET learning. If you are the type of person who doesn´t like to get lost in new cities (or new websites), then please consult my Getting Around section for a guided tour of this ePortfolio.